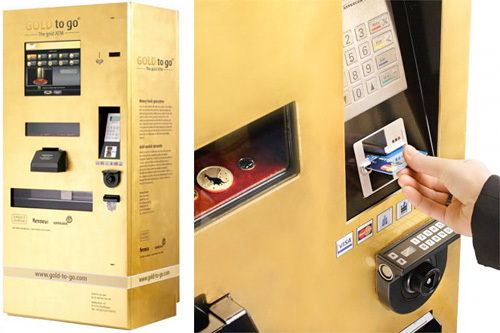 GOLD to go ATMs Are Coming To The US | OhGizmo! By Andrew Liszewski on 09/28/10 • Leave a comment! If you’ve ever been frustrated by an ATM that only distributes 20 or 50 dollar bills, be thankful you didn’t stumble across one of these GOLD to go machines in the middle of the night. First installed in Abu Dhabi’s Emirates Palace hotel earlier this year, the ingot shaped machines only distribute gold coins and bars in 1 gram, 5 gram, 10 gram and 1 ounce units. The ATMs accept cash or credit cards and are each connected to the internet allowing them to monitor and update gold prices every 10 minutes so they accurately reflect the international markets. The machines will first be rolled out in Florida and Las Vegas not surprisingly, and the company hopes to have many more installed next year in other markets where people like to make expensive impulse purchases.